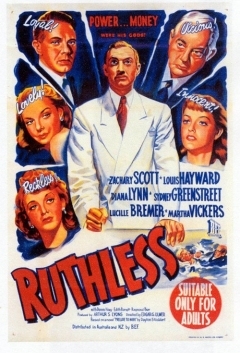 An ambitious man (Zachary Scott) from a lower-class home alienates and betrays everyone around him during his rise to power — including his best friend Vic (Louis Hayward) and childhood sweetheart (Diana Lynn). Edgar G. Ulmer’s B-level variation on Citizen Kane (one of his few higher-budget films) suffers from both a predictable plot and the surprisingly lackluster performance of its lead character (Scott), whose expression never varies and whose cold affect keeps the audience at arm’s length rather than allowing us to see what makes him tick. Diana Lynn (sweet and effective) gets it just right when describing Vendig (Scott) in the final line of the movie: “He wasn’t a man; he was a way of life”; ultimately, then, Vendig is meant to represent an archetype rather than a flesh-and-blood character, and the film’s overall emotional charge suffers for it. Interestingly, recent critics (see the Time Out Capsule Review below) seem to find something of greater worth in this “pulp poetry” than I did. No, though film fanatics may be interested in seeing Ulmer’s variation on Citizen Kane. I’d never seen this and have never known much about it; even now, I’ve only read up on it a little. So I pretty much went into it cold, thinking I’d watch in order to check it off the list. But I found myself rather wrapped up, even though I was wanting a nap. (I just rested for 20 minutes afterwards.) It should hold particular interest for ffs familiar (and taken) with Ulmer’s small-budget work. I’ve met men somewhat like the character Scott plays – and, to a degree, I find Scott’s performance subtle, esp. when he first begins his overtly manipulative moves. It’s not an easy role to maneuver, but it’s the shadings of it that I find creepy. Lynn is indeed effective in her dual role, as are Lucille Bremer (who manipulates for more personal reasons), and Sydney Greenstreet and Raymond Burr – both allowed atypical softer sides here. Two fave scenes, each with Lynn and Scott alone: first, the night before he attends Harvard; then, the night before Scott leaves ‘alone’ for New York.